I read this article and found it very interesting, thought it might be something for you. The article is called 10 Accommodations to Stay in Casablanca and is located at http://trip-n-travel.com/listicle/21696/. During your trip, an accommodation can make or break your day. How well we rest after all impacts our mood the next day. For a pleasant trip throughout your vacation, here are 10 accommodations to stay in Casablanca. Live in luxury at the Gray Boutique Hotel and Spa without exceeding your budget. The rooms are spacious enough that apart from the usual bedroom and toilet, a living room, a large balcony, and a kitchen are also included. You can also maximize their spa and pay for their services for a truly relaxing day. Explore the city with ease as the hotel is conveniently located near the Corniche, local markets, and modern shopping areas. Travel with ease at the Al Walid Hotel as it is located across the Casa Voyageurs train station and a tram are a walking distance from the hotel. The room has a practical size with all the usual features of a bed, TV, and a snack bar. The hotel offers spa services that are perfect after a tiring day. If you want to stay in shape, a gym room is also accessible for all guests. While Al-Walid is not as luxurious as most hotels, it is perfect for a convenient access to transportation. Lounge in style as this hotel offers themed rooms from famous personalities like Cleopatra, Elvis, and Julius Caesar, that makes for a truly memorable trip. Experience Morrocan culture in their Art Age restaurant that features a traditional, live band while you feast on local cuisine. To stock up on supplies, a convenience store is available across the hotel. One caveat is the hotel’s location in Casablanca’s business district, which necessitates taking a taxi to visit tourist destinations. At least the detailed, decorated rooms are a great background for pictures in itself. Located in the heart of the city, the hotel is only a walk away from tourist destinations such as mosques, shopping malls, and local markets. Given its tall structure, prepare to be amazed as a room on the top floors would give you the perfect overlooking view of the majestic city. As for your meals, there are three restaurants in the hotel to choose from and some rooms have an espresso machine for a great start to your morning. The hotel also has a spa, gym, and pool for maximum relaxation and fitness activities. Get a flattering tan at Club Val d’Anfa as it is near the most popular beach at Casablanca, La Corniche. Some rooms are overlooking the ocean, which is perfect for a peaceful ambiance. Time it right and you can even have a romantic view of the sunset from your room! For a livelier evening, a nightclub is located at the lower levels so you can party your night away while staying at this hotel. You could also opt for dinner at their restaurant and be entertained by the live belly dancing. Requiring only a short journey from the airport, this bed and breakfast will welcome you through its wooden gates with warmth as if you are coming home. The surrounding garden around the area exudes a relaxing fragrance to calm the senses. Relax by the garden in a cozy lounge or get lost in a book at their reading room. The food is particularly noteworthy for its home cooked style with high-class quality that provides an authentic Moroccan gustatory experience. As one of the newer hotels in the area, Boutique Hotel Gauthier displays modern and tasteful interior that gives your stay an edgy vibe. The hotel is also exceptionally clean because it is new and well-maintained and the staff is friendly and accommodating. It is noteworthy that their beds are comfortable, promising a good night’s rest. The location is particularly convenient as it is close to the town center, which is 30 minutes by foot or a short taxi ride. Feel right at home in this apartment-hotel. Not only are you paying for the usual bedroom, but also for a kitchenette, living room, and balcony. For those having a long stay at Casablanca, the rooms conveniently include an oven and washing machine. While the hotel itself has a restaurant, it is also close to local restaurants, giving you a wide array of choices. While you’re at it, you can also shop at the stores located near the hotel. On the contrary, you can also relax at their spa. From one of the most popular hotel chains worldwide, the Moevenpick Hotel Casablanca surely doesn’t disappoint. While the hotel is catered for business travelers than tourists, the facilities are still satisfactory. The pool is located on the top floor and is remarkably clean. For a more relaxing evening, a bar is also available by the pool. Meanwhile, the bed is comfortable and the room is tidy. 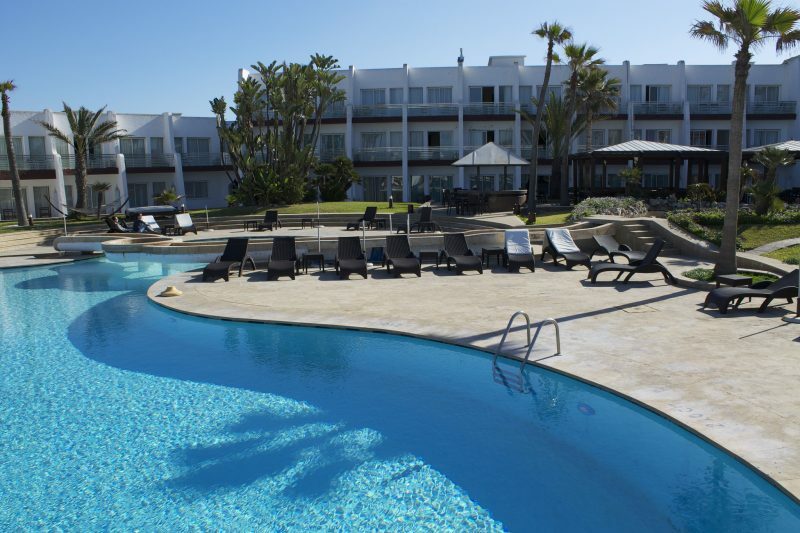 The location is also good for reaching tourist spots as it is a 25-minute tram ride to the beach and a 15-minute walk to Casablanca train station. Live in comfort and be on time for your flight at Atlas Sky Airport. Providing easy access to the airport, a free shuttle bus drives to the airport every 30 minutes. The hotel features a huge swimming pool perfect to relax in or for exercise. Upon checking in, they also offer fresh fruits in the room which are perfect after having airplane food if you have just arrived. The restaurant is also a must try with their commendable food and customer service, giving you a pleasant experience before you leave the country. After a long, exhausting day exploring the beautiful city of Casablanca, nothing sounds better than hitting the sheets and getting a good night’s rest. But these hotels go above and beyond to offer a truly pleasant experience through luxurious spas, pools, restaurants. With an accommodating staff to cater your needs, you’re sure to have a memorable time at Casablanca.